I wanted to let you know about a fabulous CAL (crochetalong) that's coming up over the summer. It's called the Festival of Finishing CAL and it's being organized by my friend Fay of the Crochet Circle Podcast. Fay has kindly provided me with the graphics to use. Thank you Fay! I think it says it all. The CAL runs from June 2nd to August 31st and you basically get out all of those unfinished projects (it could be something other than crochet ... knitting, sewing or whatever...) and get them finished. You can also frog them. I like that idea. I'm not scared of frogging at all. Sometimes I wear something several times and decide I don't like it and make it into something else. Of course there is sharing to be done on Instagram. I have so much fun looking at the hashtags. The hashtag is #FestivalOfFinishing and there is a going to be a CAL specific thread on Ravelry too. I am very excited about this. I have a sweater that I must finish. I am in the final stages, on the arms, but I've become hopelessly distracted by other projects... again. I started it last year. And at the beginning of the year I was telling myself this was going to be the year of the crochet garment and I am running out of time. It's just not happening! There is also a charity element to the CAL which I love. For every FO (that's finished object) that hits the Ravelry thread or is added to the #, Fay is going to donate £1 (around $1.30) via KNIT IT – HOOK IT – CRAFT IT (that's Fay's business) to Knit for Peace up to a total of £150 (almost $200). So that's the target 150 FOs in the lists by the end of August! £150 donated to Knit for Peace would help to deliver over 750 knitted and crocheted items to people that need them in the UK and abroad. So we will be feeling great after finishing projects at long last and also doing a little bit for charity at the same time. Lovely! So start looking in all of those places where you know there are unfinished projects hidden away. 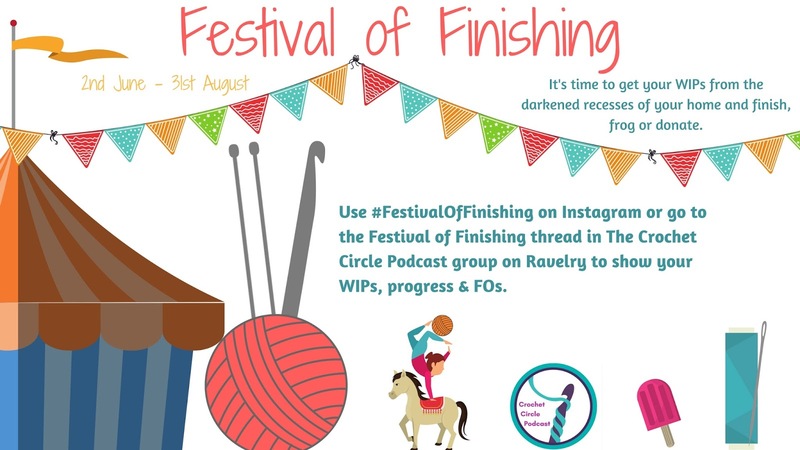 You've got just over a week and join us for the Festival of Finishing on Instagram by using the hashtag and/or on the Ravelry group thread from June 2nd. Thank you once again I am off to look in all those places where I have hidden my unfinished projects ...Mh my penguin ,my baby and adult kangaroo toys my...yes lots of unfinished things . Yes do it mum. I have found eight projects so far....!!! This will definitely encourage me to finish my projects as well! Maybe I could finally finish the sweater I've been knitting for my husband (literally for YEARS lol). Hey Nicole - yes please do share it in your newsletter. That woudl be great! I'm sure Fay would be more than happy about this. It should actually be a CrAL not a CAL - which is a Craftalong since all crafts qualify. So knitting is definitely included and your hubby needs that sweater!! I look forward to hearing about your progress in the chatter thread! I love the charity incentive! When I was in hospital, my family discovered a project in the bottom of my WIP box which was more than 3 years old! I've been slowly working on it but can't see it being done by 31 August, sadly, not lack of motivation? Just the way life is turning out this year. Good luck with your multitude of WIPs, Tamara. Lots of good to come from getting those done. Thanks for all the craftivism links too. You'll have to find a smaller WIP project to work on Jodie. I have two blankets on my list and there is just no way I'm going to get those done! Fay will be talking about the Festival of Finishing this Friday on her podcast so I'm sure she will have ideas for us! !